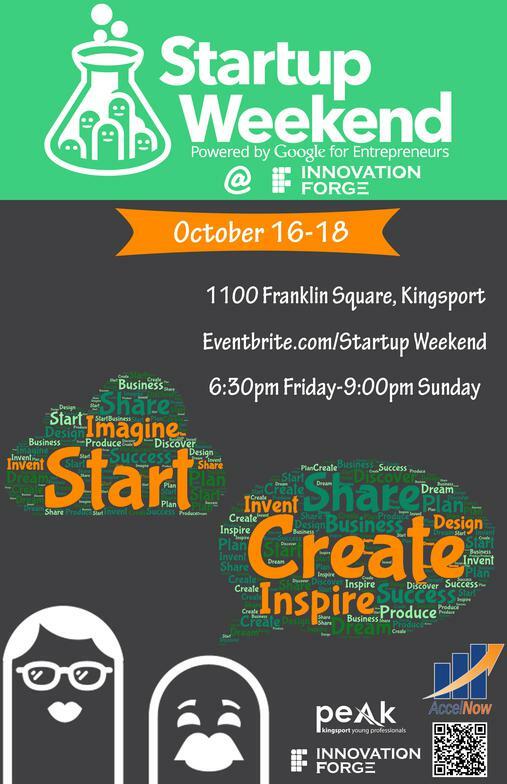 AccelNow is bringing Startup Weekend to the Tri-Cities November 16-18! It will be held on the campus of ETSU in Johnson City, TN. Beginning with open mic pitches on Friday at 6PM in Brown Hall Auditorium, attendees bring their best ideas and inspire others to join their team. Teams will move to break out rooms in Sam Wilson Hall, College of Business & Technology. Over Saturday and Sunday teams focus on customer development, validating their ideas, practicing LEAN Startup Methodologies and building a minimal viable product. On Sunday evening the action moves back to Brown Hall Auditorium, where teams demo their prototypes and receive valuable feedback from a panel of judges. The top two teams selected by the judges will win valuable prizes. The top team will be eligible to enter a video pitch into the Global Startup Battle? and compete with over 200 other Startup Weekend event winners for incredible prizes and travel. The Angel Roundtable's Executive Director, Tony Lettich is serving as one of the judges. To Learn More about AccelNow'sÂ Startup Weekend Tri-Cities click here! Camp includes 8 weeks of seminar sessions, business pitch development, pitch coaching and practice. It will culminate on December 5th at 6:00 PM with Demo Day, at the offices of AccelNow at the Borla Complex. Demo Day is being co-sponsored by The Angel Roundtable. The companies will pitch their business models to a panel of investors and the public for cash prizes and services. Investors are invited to attend! There is no charge, but registration required. If you would like more information or to register, please contact Tony Lettich, Executive Director, The Angel Roundtable at TLettich@Comcast.Net. AccelNow is bringing Startup Weekend back to the Tri-Cities April 5th - 7th. Like last years event, it will be held on the campus of ETSU in Johnson City, TN. Startup Weekends are 54-hour events where developers, designers, marketers, product manangers and startup enthusiasts come together to share ideas, form teams, build products and launch startups. Tony Lettich, The Angel Roundtable's Executive Director, will be serving as one of the judges again this year. Mark your calendar now for this enjoyable event and watch the AccelNow and Angel Roundtable's website for details! The Angel Roundtable is partnering with AccelNow to provide ThrottleUp! Boot Camp - Demo Day. AccelNow will provide intensive training, coaching and mentoring for participating companies who are serious about taking their efforts to the next level. The Boot Camp includes seven weeks of seminar sessions, business pitch development and pitch coaching and practice. It will culminate on May 22nd at 6:00 PM with Demo Day pitches to angel investors. Demo Day is being co-sponsored by The Angel Roundtable. Investors are invited to attend! There is no charge, but registration required. If you would like more information or to register, please contact Tony Lettich, Executive Director, The Angel Roundtable at tony@theangelroundtable.com . LaunchTN presents The TENN, a statewide Demo Day and Master Mentor program. The TENN initiative is aimed at providing additional assistance to the top ten companies graduating from Tennessee’s nine regional business accelerators over the previous twelve months. (9/1/2012 – 8/31/13). The Companies participating in the TENN will be in the Tri-Cities on September 9th. They will be presenting to Eastman in the morning and will be presenting to Tri-Cities business Leaders and Investors in the afternoon. Details to be announced. The TENN is co-sponsored by the Blackstone Charitable Foundation. The ten companies chosen will not only participate in the statewide demo day on the 27th August in Nashville and the statewide roadshow, but they will also attend targeted trips to NYC and Silicon Valley. NASHVILLE, Tenn., Aug. 15, 2013 – Launch Tennessee (LaunchTN) today announced that 20 companies – all graduates from one of Tennessee’s nine startup accelerators – have been chosen to pitch at the first-ever statewide demo day on Tuesday, Aug. 27 at the Bridge Building in Nashville. During statewide demo day, 10 of these companies will be chosen to participate in The TENN, the state’s first master accelerator program, sponsored by the Blackstone Charitable Foundation. The demo day investor panel includes Sabeer Bhatia, chairman and CEO of Sabse/Jaxtr and founder and former CEO of Hotmail; John McIlwraith, managing partner at Cincinnati, Ohio-based Allos Ventures; John Greathouse, general partner at Santa Barbara, Calif.-based Rincon Venture Partners; Sig Mosley, managing partner at Atlanta, Ga.-based Mosley Ventures; Bob Crutchfield, partner at Birmingham, Ala.-based Harbert Ventures; and Mike Tatum, serial entrepreneur and CEO of Workbus. Governor Bill Haslam will announce the 10 companies that will comprise The TENN. Shortly after demo day, The TENN companies will leave for a statewide bus tour, where they will meet with leaders of Tennessee’s top corporations as well as leading angel and venture capital investors from throughout the state. Additionally, during the master accelerator program, the members of The TENN will fly to California and the East Coast to network with venture capitalists and angel investors. Other benefits of The TENN program include access to 40 master mentors from across Tennessee, including investors, entrepreneurs and corporate leaders; office space in the nearest regional accelerator or a subsidy for the company’s existing office space; and events that introduce the companies to high-level, industry-specific Tennessee connections. Launch Tennessee (LaunchTN) is a public-private partnership focused on supporting the development of high-growth companies in the state of Tennessee with the ultimate goal of fostering job creation and economic growth. LaunchTN focuses on four key areas: entrepreneurship, commercialization, capital, and outreach. LaunchTN is in part funded by a grant from the State of Tennessee. Please friend LaunchTN on Facebook (www.Facebook.com/LaunchTN), Twitter (www.Twitter.com/LaunchTN), YouTube (www.YouTube.com/LaunchTN) and Flickr (www.Flickr.com/LaunchTN). Life Sciences Tennessee is sponsoring BioTech and Beer, a casual networking event on Thursday, September 12, 2013 from 5:30pm - 7:30pm at the ETSU / Eastman Valleybrook Campus at 122 Pickens Road, Kingsport, TN.